The operative element in "Synchronicity" is time- the Greek root means "to be contemporary" or "happen at the same time" (syn 'together' & chronos 'time'). So when we're looking for synchronicities- or something else, perhaps- we keep an eye on the timing of events. A powerful new solar observatory will spend the next five years recording images of the sun with 10 times better resolution than HD television, peering deep within the sun's layers to reveal just how solar storms erupt. 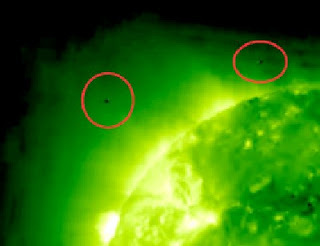 The observations could help scientists build the first effective models for space weather forecasting. NASA's Solar Dynamics Observatory (SDO) is slated for launch on Feb. 10 from the Kennedy Space Center in Cape Canaveral, Fla. It carries three instruments that will pierce the mysteries enshrouding the sun's magnetic fields and ultraviolet radiation, which together help shape the Earth's atmosphere every day. "The unique characteristic of SDO is that it is designed to see everything all the time," said Madhulika Guhathakurta, SDO Project Scientist NASA Headquarters in Washington, D.C. It turns out the mission was scrubbed for today and will be rescheduled. But a crazy word keeps popping into my head when I think about the timing of the SOHO images and the SDO launch. It's like a itch I can't scratch. The word? We've also been mulling over the Astronautical Theology of the Super Bowl, with "Sirius" kicking off the game and the Who with their Solar/Saucer imagery. And lo and behold the Who did perform the CSI:Miami theme song in their halftime medley. The next day that show presented us with a Grissom-like martyred astronaut theme with a Man Who Fell to Earth subtext. But as Reader Jason reminds us, the Who also link us to Ken Russell, director of their rock opera Tommy, as well as Altered States, the innerspace odyssey that's the touchstone of the "Alien Dreaming and the Widening Gyre" series. Russell also directed Who singer Roger Daltrey in Lisztomania, which is the improbable name of a current hit by French hipster band Phoenix. NASA's Phoenix mission was recently in the news itself, since it seems to have gone the way of so many Mars missions. Meaning it seems to have met a premature and unexpected end. You can drive yourself insane with this stuff. UPDATE: Speaking of timing- Bo, the "major issue" with "star quality" is seen playing in the snow in some photos the White House just released. 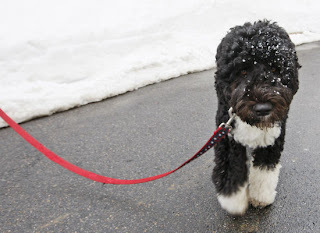 Don't forget Bo is a Portuguese water dog, just in case the Sirius meme hasn't been drilled into your forehead yet. The snow kind of looks like stars on Bo's forehead there, no? 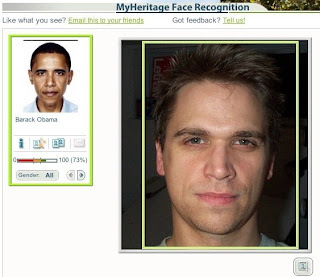 We also hear today that Obama now has an "attack dog" as well.